Here we were thinking the Holy Trinity referred to Westeros, Winterfell and The Wall, but boy were we wrong. It turns out South East Asia has mastered their own holy trinity and it comes in the form of pandan, coconut and palm sugar. 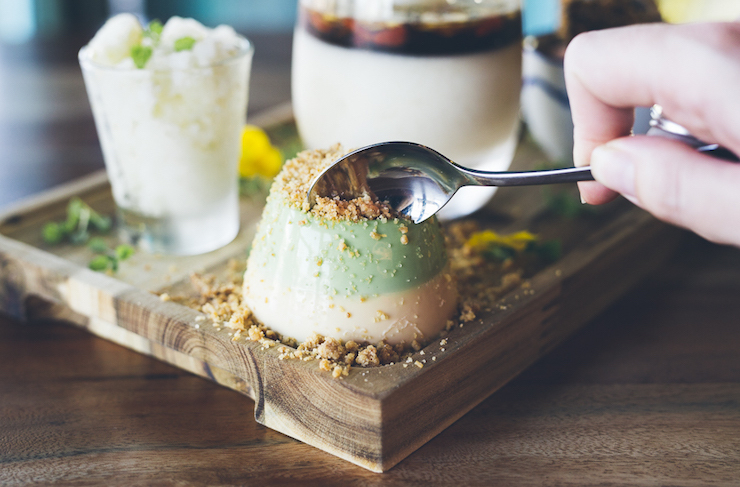 For those of you filling up on pad thai and bao buns, it's time to practise some self control during the main course so you can experience the joy that is dessert at some of the best Asian restaurants in Perth. From fine dining Asian desserts to a scoop of black sesame gelato, here are our picks of the best Asian desserts in Perth. 1. Banana Roti at Long Chim, Perth—like you could go to Long Chim and not save space for the dessert that's so good it's gained a cult following in Perth. 2. Matcha Lava Cake at Rice Baby, Subiaco—deep, dark and mysteriously delicious chocolate lava cake scattered with matcha powder. There’s green on the plate, so it’s healthy, right? 3. 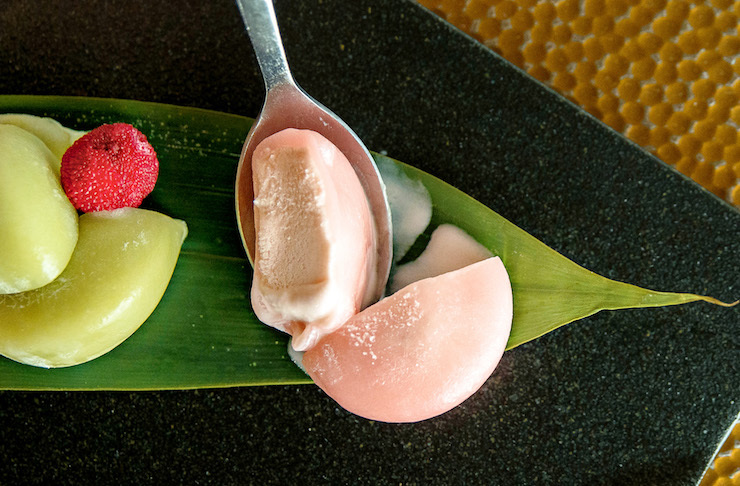 The Mochi Balls at Nobu, Burswood—ice cream encased by pounded sticky rice which kind of tastes like heaven. 4. Miso Cappuccino at Nobu, Burswood—yeah that's right, we put Nobu in twice, they're just that good, and the Miso cap is weird but all sorts of wonderful. 5. Steamed Custard Bun at New Moon, Northbridge—all the oozy and flaky goodness that you need in a post dim sum dessert. Not too sweet, not too salty. These are juuuust right. 6. Matcha Opera Bar at Little Matcha Girl, Como—decadently rich layers of cake, chocolate and buttercream. Pair it with a matcha latte for a winning combo. 7. Steamed Golden Lava Buns at Miss Chows, Claremont—it’s probably a good idea to leave room for dessert dumplings and while you’re at it, an espresso martini. Because you know, YOLO. 8. Green Tea Bubble Tea at Hi Tea, Morley—one of our favourite bubble tea spots in town, serving up all the bubbly goodness that’ll hit the sweet spot any time of the day. 9. Egg Tarts at Fortune Five Chinese Restaurant, Northbridge—the egg tart competition across Perth’s dim sum joints is a tough call, but there’s no doubt that Fortune Five is our fave for a Chinese take on the buttery Portuguese Tart. 10. Soybean Pudding at Taro Taro, Victoria Park—a bucket full of the softest jelly, taro balls and all the fun extras you’ll get carried away ordering. The authentic taste of Taiwan! 11. 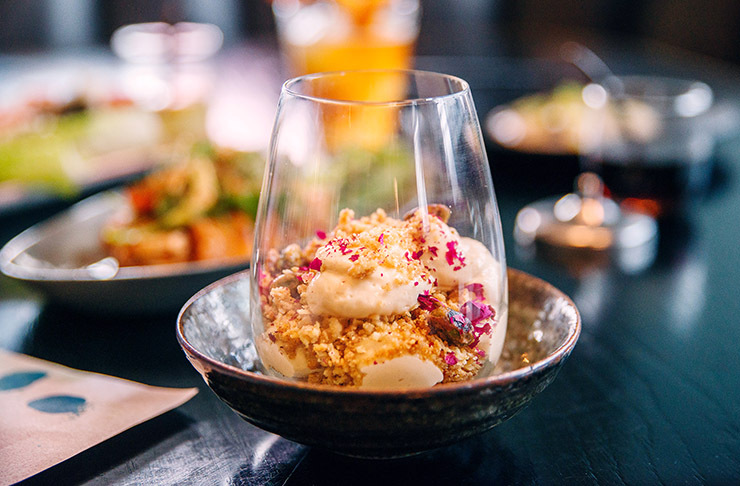 Chai Wallah Cheesecake at The Apple Daily, Perth—filling our dreams of a chai and rose dessert one little deconstructed cheesecake. 12. Coconut Sago at Post, Perth—it’s so so much more than your usually coconut sago, trust us. The perfect combo of coconut, passion fruit, macadamia, banana and lime tucked in the corner of a picture perfect plate. 13. Durian Strudel at Nasi Lemak Corner, Como and Mosman Park—all around Perth, Malaysians are celebrating the durian strudel. Love it or hate it, you at least gotta try it. Creamy durian smooshed between two pieces of pastry and served with ice-cream. 14. 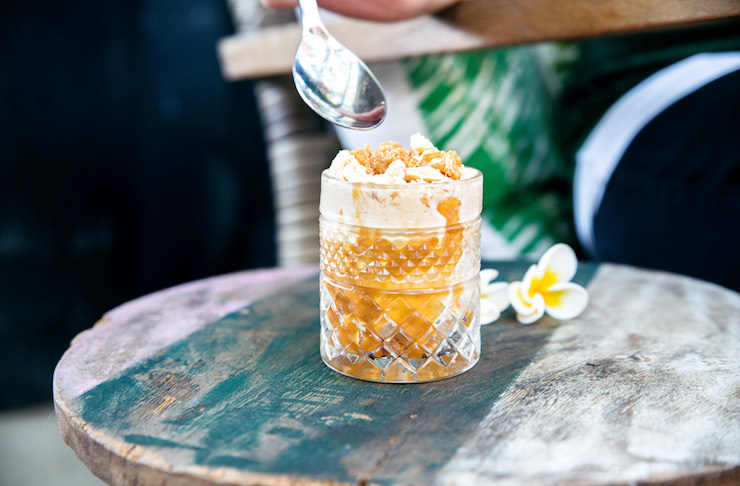 The Peanut Butter Parfait at Kitsch Bar, Leederville—yeah ok it's not that Asian, but it's at Kitsch and it's amazing. If you really want something with some Asian flavours, try the kaffir lime and coconut panna cotta. 15. Sticky Rice at Wok St Chow House, Perth—if you see sticky rice on a menu and don't order it you must be dead inside. This one comes with pineapple and red beans and it's phenomenal. 16. Pandan Puff at Master Chang’s Bakery, Thornlie—Pandan and puff. Two words we love to hear in a sentence. Flaky pastry with oozy Pandan inside. Like you needed another reason to go to Spencer Village. 17. Cendol at Malaysian Dining Delights, Bentley—a traditional South East Asian favourite full of coconut, jelly, palm sugar and a whole lotta other bits you get to choose. 18. Matcha Brulee at Nine Fine Foods, Highgate—apparently crème brulee can get better and Nine Fine Foods has figured out how. Matcha, that’s how. Creamy pots of heaven with hints of green tea. 19. Strawberry Ice Volcano at The Dessert Story, Cannington—literally a volcano shaped mountain of red strawberry ice topped with vanilla ice-cream and fresh strawberries. 20. Black Sesame Tiramisu at Ha-Lu, Mount Hawthorn—it looks like a traditional tiramisu tucked into a glass, covered in cocoa and topped with a giant piece of finger sponge, but just like everything at Ha-Lu, it’s so much more. 21. Banana Fritters with Caramel Sauce at Miss Potz, Mount Lawley—deep fried bananery goodness with a sticky caramel and soothing ice-cream. Mmmmm crispy, warm fruit. 22. Daifuku Muffle Cone at Muffle & Co, Fremantle—hilariously bumpy waffle cones jam packed with green tea ice-cream, red beans, mochi balls and strawberries. Two words: Go hungry. 23. Dessert Trio at Neho Asian Tapas, Victoria Park—a little pandan panna cotta, a little coconut granita and a little crème caramel with all the yummy crunchy bits. This is smooth sailing deliciousness that you may or may not want to share. 24. Coconut Sago at Icey Ice iDessert, Northbridge—not too sweet and super light coconut milk sago drink with all the usual trimmings. Personally, we’re all about the watermelon and jelly. 25. Vietnamese Coffee at Three Sisters Vietnamese Tuckshop, Leederville—a dark and stormy espresso made smooth and sweet with condensed milk. Think of it like Vietnam’s version of an affogato…except better. 26. Black Sesame Ice-Cream at Chicho, Northbridge—oh Chicho, you’ve done it again. This time in a nutty, earthy, tahini-ish black sesame ice-cream. Extra chocolate on the cone? Ah…yeah! 27. Sago Melaka at Ria Malay Kitchen, Leederville—think of it like a Malaysian version of porridge. But for dessert. Little balls of sago in a rich but smooth coconut sauce, topped with apple and pear. Pretty much the taste of childhood. 28. Cotton Candy Hot Chocolate at Shark Bites Toast, East Victoria Park—you’ll be confused by the cloud that comes to your table but paired with a warm ho-choc, you’ll wonder why it hasn’t been done before. Sweet, rich, chocolate perfection. 29. Taiyaki Waffle at Whisk Creamery, Subiaco and Northbridge—a super cute Japanese waffle cone in the shape of a fun fish loaded with matcha gelato, red beans and strawberry. 30. The Rock Garden at Low Key Chow House, Leederville—basically everything you’ve ever wanted in an Asian dessert. Chocolate chilli mousse boulder, spicy chai soil, hazelnut pebbles, ca phe da (Vietnamese coffee) stones and fresh fruit. 31. Dessert Bao at Lucky Chan’s Laundry and Noodle Bar, Northbridge—it doesn’t matter that every week the treats inside change. All you need you know is it’s a dessert bao. As in steamed or fried little buns of Lucky Chan’s perfection loaded with all the delish things you can imagine like chocolate, fruit, coconut, nuts, popcorn and ice-cream. Already done all the best Asian desserts in Perth? Check out our Ultimate Asian Eats Bucket List and tick those off too.